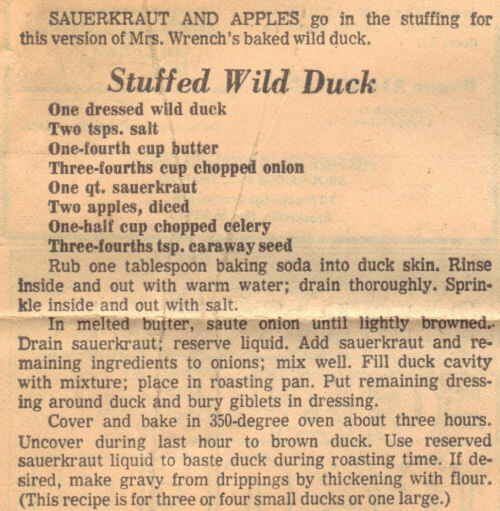 SAUERKRAUT AND APPLES go in the stuffing for this version of Mrs. Wrench’s baked wild duck. Rub one tablespoon baking soda into duck skin. Rinse inside and out with warm water; drain thoroughly. Sprinkle inside and out with salt. In melted butter, saute onion until lightly browned. Drain sauerkraut; reserve liquid. Add sauerkraut and remaining ingredients to onions; mix well. Fill duck cavity with mixture; place in roasting pan. Put remaining dressing around duck and bury giblets in dressing. Cover and bake in 350-degree oven about three hours. Uncover during last hour to brown duck. Use reserved sauerkraut liquid to baste duck during roasting time. If desired, make gravy from drippings by thickening with flour.